Become a master of self-storage sales and service! This select, discount bundle offers insight to sales strategies and techniques, customer service and experience, relationship building, and more. 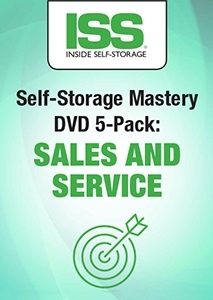 Our Self-Storage Mastery DVD packs combine some of the best education sessions recorded during recent Inside Self-Storage World Expo events. Based on popular themes, these five-DVD bundles provide valuable, in-depth knowledge on highly requested topics of interest—at significant savings! Rent That Unit! Self-Storage Sales Strategies to Seal the Deal – Learn indispensable sales techniques you can implement immediately to build relationships with customers, ask the right questions, improve phone skills, overcome objections and close more overall rentals. A Realistic Approach to Self-Storage Customer Service: Cutting Through the Clutter – Gain a better understanding of your self-storage customers’ needs and enhance your service in this management session. Topics include building rapport, creating to-do lists and fostering referrals. The Lost Art of Service: Creating a Magical Experience for Self-Storage Customers – We’ve all learned proven techniques to close a self-storage sale, but how do we go above and beyond for our customers? Discover how to take every aspect of the customer experience to a new level. Top Things Self-Storage Managers Can Do to Increase Facility Revenue Without Even Trying – Want to increase revenue at your self-storage facility? Get proven profit strategies to handle customer inquiries, improve ancillary sales, expand your referral program and edge out your competition. Sales and Service Fundamentals for Self-Storage Facility Managers – Learn effective sales strategies for closing every self-storage rental as well as tips for overcoming customer objections, achieving service excellence, handling difficult service situations and more. For full session descriptions, please click on the linked titles to view the individual product page.